If you watched the video I linked to a few weeks ago about goal setting, I loved what Nikki had to say about setting small, routine refining goals that are achievable. Goals that are so small it seems silly to not do them because they’re so easy. I liked that she set some of her goals to literally just 2-5 minutes a day. In other words, don’t be afraid to set the bar low and let these things become habit and then amp them up to something bigger later on. One of my new years resolutions is to bring back a habit I literally had my entire life until a few years ago and I’ve had the worst time regaining: reading. Since I could read, I’ve always spent my last waking moments each day with my nose in a book. I dropped the habit for a while and have struggled ever since to read more and get the ball rolling again. 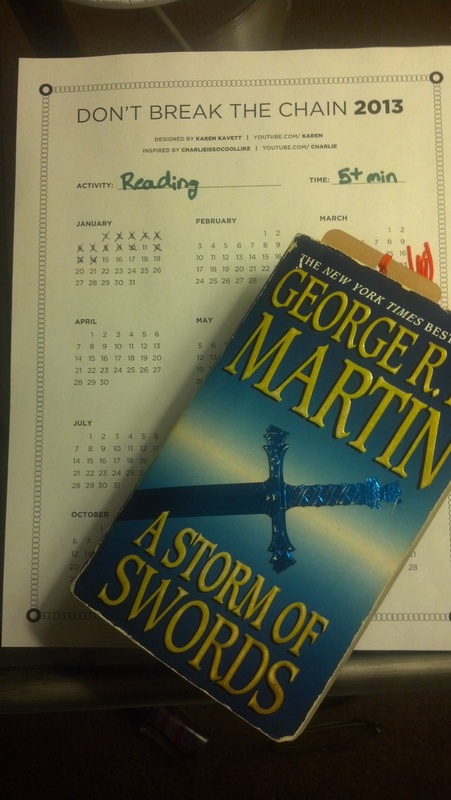 I’ve put a few measures into place that are helping that I’ll probably go into more later, but today I’m talking about tracking the goal I set for myself: 5+ minutes a day reading. So, how do I track whether I’m actually doing this reading every day? I found a great little gimmick, also thanks to YouTube, called the Don’t Break the Chain Calendar. The concept is simple: make the longest “chain” possible by checking off the days on the calendar as you do your goal. I’m keeping it right by my bed with my book so I can see my progress and check the days off as I do my reading. It’s simple, easy, visual, and gives me a little extra reminder to just crack the book for a few minutes before shutting off the light. Plus, anyone who’s attempting to keep me on track can check at any time. I could even put these up in a public place for more pride and/or shaming, if that’s what it takes.Do you have any tips for how you track your goals? Let me know, I’d love to hear them! The calendar was designed by the ever-talented Karen Kavett and inspired by the so-cool-like Charlie McDonnell. I recommend checking out both of them on YouTube and/or the myriad of other social networks they frequent!